Hey everyone! 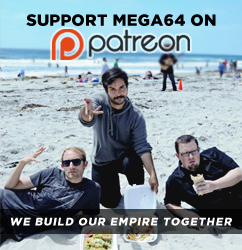 It's time for yet another amazing episode of the Mega64 Podcast! In this episode: Everyone trys to make me unconfortable by talking about my clean shaven face, we talk about streaming with Koji Igarashi for his kickstarter for Bloodstained: Ritual of the Night! We also talk about filming Nintendo's E3 2015 announcement trailer at the Nintendo headquarters in Seattle! Plus, we talk vid games and Mad Max Fury Road...Check it out!!! Listen to the audio version here!!!! Beofre you go, we still have a COUPLE of the Mega64 Snapback Hats in stock! If you wanted to get one, now is the time!!!!! !